This review study aimed to compare the electronic prescription systems in five selected countries (Denmark, Finland, Sweden, England, and the United States). Compared developed countries were selected by the identified selection process from the countries that have electronic prescription systems. Required data were collected by searching the valid databases, most widely used search engines, and visiting websites related to the national electronic prescription system of each country and also sending E-mails to the related organizations using specifically designed data collection forms. The findings showed that the electronic prescription system was used at the national, state, local, and area levels in the studied countries and covered the whole prescription process or part of it. There were capabilities of creating electronic prescription, decision support, electronically transmitting prescriptions from prescriber systems to the pharmacies, retrieving the electronic prescription at the pharmacy, electronic refilling prescriptions in all studied countries. The patient, prescriber, and dispenser were main human actors, as well as the prescribing and dispensing providers were main system actors of the Electronic Prescription Service. The selected countries have accurate, regular, and systematic plans to use electronic prescription system, and health ministry of these countries was responsible for coordinating and leading the electronic health. It is suggested to use experiences and programs of the leading countries to design and develop the electronic prescription systems. Recent case reports in medical literatures suggest that more and more second-generation atypical antipsychotics (AAs) have been prescribed for off-label use; quetiapine (Brand name: Seroquel®) showed increase in its trend for off-label use. Little is known about the reasons behind this trend, although historical sedative and hypnotic prescription patterns suggest that despite relatively superior safety profiles of quetiapine (especially for movement disorders), it may be used for treating substance abuse disorder. In addition, recent studies have shown a strong potential for misuse and abuse (MUA) of quetiapine beyond Food and Drug Administration-approved indications. This includes drug-seeking behaviors, such as feigning symptoms, motivated by quetiapine and use of quetiapine in conjunction with alcohol. Quetiapine appears to be the most documented AA with street values bartered illicitly on the street. A recent report from the Drug Abuse Warning Network has shown a high prevalence of quetiapine-related emergency department visits involving MUA. Several other case studies have found that quetiapine causes seeking behaviors observed in substance use disorder. In fact, the majority of quetiapine MUA involved patients diagnosed with substance use disorder. In the absence of a definitive mechanism of action of quetiapine's reinforcing properties, it is imperative to gather robust evidence to support or refute increasing off-label use of AAs. Objective: Vitamin D deficiency is quite common among end-stage renal disease (ESRD) patients, and Vitamin D administration could reduce morbidity and mortality in these patients through different mechanisms. Cardiovascular diseases are the most common cause of mortality in these patients that are caused by vascular injuries. Intracellular adhesion molecule (ICAM) and vascular cell adhesion molecule (VCAM) are vascular inflammation indicators. The goal of this study is to find the effect of Vitamin D administration on ICAM-1 and VCAM-1 serum levels in ESRD patients on hemodialysis. Methods: The current study is a double-blind, randomized, placebo-controlled clinical trial on 64 patients in two groups of control and treatment. Serum levels of Vitamin D, ICAM-1, and VCAM-1 were measured before and after the study. Treatment group was treated with Vitamin D pearls while control group underwent treatment with placebo pearls. Average serum levels of Vitamin D, ICAM, and VCAM were measured in both groups before and after the study and were analyzed by ANOVA, paired t-test, and Chi-square test using SPSS software. Findings: Sixty-four ESRD patients were recruited for this study consisting of 32 male and 32 female subjects within the ages of 18 and 76 years. 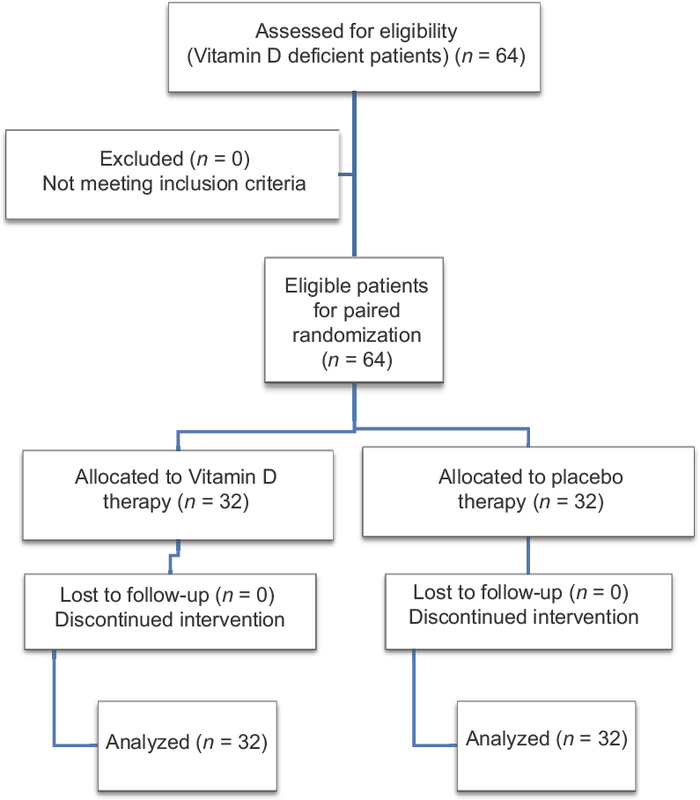 The change in serum level of Vitamin D was significant in treatment group (P = 0.001) but not in control group (P > 0.05). Serum levels of ICAM and VCAM also changed significantly in treatment group (P = 0.001) but not in control group (P > 0.05) Conclusion: Based on the findings of this study, it could be said that Vitamin D administration in ESRD patients may increase serum level of Vitamin D up to four times. It also reduces serum levels of ICAM and VCAM which might improve the vascular condition of these patients. Objective: Satisfaction is becoming a popular health-care quality indicator as it reflects the reality of service or care provided. 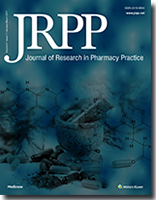 The aim of this study was to assess the level of patients' expectation toward and satisfaction from pharmacy service provided and to identify associated factor that might affect their expectation and satisfaction. Methods: A cross-sectional study was conducted on 287 patients, who were served in five pharmacies of Gondar University Hospital in May 2015. Data regarding socio-demographic characteristics and parameters that measure patients' expectation and satisfaction were collected through interview using the Amharic version of the questionnaire. Data were entered into SPSS version 21, and descriptive statistics, cross-tabs, and binary logistic regressions were utilized. P < 0.05 was used to declare association. Findings: Among 287 respondents involved in the study, 149 (51.9%) claimed to be satisfied with the pharmacy service and setting. Two hundred and twenty-nine (79.4%) respondents have high expectation toward gaining good services. Even though significant association was observed between the pharmacy type and patients level of satisfaction, sociodemographic characteristics of a patient were not found to predict the level of satisfaction. There is a higher level of expectation among study participants who earn higher income per month (>(2000 Ethiopian birr [ETB]) than those who get less income (<1000 ETB). Conclusion: Although patients have a higher level of expectation toward pharmacy services, their satisfaction from the service was found to be low. Objective: Pulmonary hypertension is a serious complication in patients suffering from chronic obstructive pulmonary disease (COPD). The aim of this study is to investigate the effects of atorvastatin in reducing pulmonary arterial pressure in COPD patients. Methods: This double-blind, randomized trial was conducted on 42 known cases of COPD with systolic pulmonary arterial pressure of more than 25 mmHg. The patients were randomly assigned into two groups, 21 patients with atorvastatin treatment (40 mg/daily for 6 months) and 21 patients without receiving atorvastatin. All the patients participated voluntarily and provided written informed consent. The trial was registered in the Iranian Registry of Clinical Trials. Pulmonary pressure was also anticipated by Doppler echocardiography with peak pressure gradient of tricuspid regurgitation. Both groups were tested with echocardiography to measure systolic pulmonary pressure at baseline and posttreatment. Statistical analysis includes Chi-square, Student's t-test, and Wilcoxon test. P < 0.05 was considered statistically significant. Findings: The mean age was 65.8 ± 11.5 years for atorvastatin group and 63.7 ± 7.6 years for control group (P = 0.45). Baseline and posttreatment mean systolic pulmonary artery pressure (PAP) levels in the atorvastatin group were 48.9 ± 3.3 and 38.4 ± 1.9 mmHg, respectively (P = 0.007). In the control group, mean systolic PAP levels at baseline and 6 months later were 45.6 ± 3.1 and 38.9 ± 2.4 mmHg, respectively (P = 0.073). The patients treated with atorvastatin showed significant decrease in total cholesterol (P = 0.001) and low-density lipoprotein cholesterol (P = 0.008). Conclusion: A 40 mg dose of atorvastatin daily for 6 months may have beneficial effects in reducing PAP in patients with COPD. Further studies are necessary to find long-term effects of statins in COPD patients. Objective: This study assessed incidence, severity, and time to occurrence of drug-induced leukopenia/thrombocytopenia within 1st month after kidney transplantation. Methods: This cross-sectional study was conducted on newly kidney transplant recipients from two hospitals, Iran. Patients with thrombocytopenia due to acute antibody-mediated rejection were excluded from the study. Demographic, clinical, and laboratory data of patients within the 1st month after transplantation were collected. Findings: Of 213 patients, 14.1% and 66.2% experienced leukopenia and thrombocytopenia, respectively. Cytopenia happened more commonly among patients with thymoglobulin-containing regimen (for leukopenia: 24.6% vs. 0%, P < 0.001; for thrombocytopenia 84.4% vs. 41.8%, P < 0.001). Most leukopenia patients experienced Grades 1 and 2 of leukopenia (46.6% and 40% of patients). Most thrombocytopenic patients showed Grade 1 of thrombocytopenia (78.7%). Cumulative dose of thymoglobulin did not differ between patients with and without leukopenia (5.57 ± 1.13 vs. 5.9 ± 1.96 mg/kg; P = 0.613) or with and without thrombocytopenia (5.87 ± 1.86 vs. 5.56 ± 1.38 mg/kg; P = 0.29). Cytopenia were more common among recipients from deceased compared with from living donors (91.3% vs. 8.7% for leukopenia patients, P = 0.001; 69.9% vs. 33.1% for thrombocytopenia, P = 0.02). More patients with kidney from deceased donors received thymoglobulin in their immunosuppressive regimen (82% vs. 37%; P < 0.001). The median time to leukopenia and thrombocytopenia were 3 days and 1 day, respectively. Conclusion: Among immunosuppressive and prophylactic antimicrobial agents, thymoglobulin is more related to cytopenia; therefore, thymoglobulin dose reduction is recommended as the first intervention to manage cytopenia without need for reduction of its cumulative dose. The higher prevalence of cytopenia among recipients from deceased donors may be related to the higher use of thymoglobulin in these patients. Objective: One of the main problems facing public health providers and administrators in many countries is ensuring the rational use of high-cost drugs. In this regard, on-going process of medication use evaluation can be considered as a useful tool. In this study, we evaluated certain usage aspects of a highly-cost medication, that is, recombinant growth hormone (GH). Methods: This cross-sectional study conducted from August 2012 to August 2014. Children receiving GH ± gonadotropin releasing hormone (GnRH) analogs were included in the study. A researcher-designed checklist was developed to evaluate the GH utilization in these patients. Baseline demographic characteristics and background clinical and growth data, as well as any aspects of drug therapy including indications, dosing, monitoring, and discontinuation were collected from the patients' medical records. Findings: Seventy children receiving GH entered the study, of which 23 patients (32.85%) received GH and GnRH analogs simultaneously. At the baseline, 67 children (95.7%) had GH stimulation test, whereas serum insulin-like growth factor-1 (IGF-1) levels were measured in 63 (90%) patients. Sixty-seven patients (95.71%) had thyroid function test, whereas bone age was determined in 68 children (97.14%). The mean ± standard deviation of GH dose for idiopathic short stature, GH deficiency, Turner's syndrome and born small for gestational age in our study was 0.22 ± 0.025 mg/kg/week, 0.23 ± 0.04 mg/kg/week, 0.22 ± 0.015 mg/kg/week, and 0.23 ± 0.02 mg/kg/week, respectively. Height and weight of all patients were followed every 3–6 months, regularly. Thirty patients were treated with GH for at least 1 year, of which thyroid hormones and IGF-1 levels were measured annually in 25 (83.33%) and 26 (86.66%) patients, respectively; while bone age was evaluated in 13 (43.33%) children, annually. GH treatment was discontinued in 15 patients (21.42%), while financial problem was the major reason. Conclusion: Diagnostic tests and monitoring of height, weight, IGF-1 level and thyroid function was properly performed in this setting. However, a number of patients with ISS and Turner's syndrome were under-dosed. Objective: In this study, frequency and antimicrobial sensitivity pattern of multidrug resistant (MDR) microorganisms were evaluated in a referral teaching hospital in Iran. Methods: Patients with MDR Gram-negative pathogens were followed during the course of hospitalization. Demographic data, baseline diseases, type of biological sample, isolated microorganism, type of infection, antibiotic regimen before the availability of the culture result and change in the antibiotic regimen following receiving the antibiogram results, response to the treatment regimen, and duration of hospitalization and patient's outcome were considered variables for each recruited patient. Findings: In 71% of the patients, antibiotic regimens were changed according to the antibiogram results. A carbapenem alone or plus amikacin or ciprofloxacin were selected regimens for patients with extended-spectrum beta-lactamase (ESBL) infections. For patients with probable carbapenem-resistant Enterobacteriaceae infections, a carbapenem plus colistin was the most common antibiotic regimen. Clinical response was detected in 54.5% of the patients who were treated based on the antibiogram results. Clinical response was higher in the ESBL producers (ESBL-P) than the non-ESBL-P infections (75% vs. 52%). However, this difference was not significant (P = 0.09). Most nonresponders (80%) had sepsis due to Klebsiella species. Finally, 41.9% of the patients were discharged from the hospital and 58.2% died. Conclusion: Same as other countries, infections due MDR microorganisms is increasing in the recent years. This type of resistance caused poor clinical response and high rate mortality in the patients. Objective: Selenium depletion has been reported in critical illness correlates with an increase in mortality and morbidity. In this study, we aimed to access the selenium plasma levels of septic patients early at the Intensive Care Unit (ICU) admission in order to compare with reference range. Methods: We conducted a cross-sectional study in a university affiliated hospital aiming to assess the early plasma level of selenium in ICU admitted patients. eighty patients diagnoses with sepsis were included and considered for characteristic evaluation, monitoring criteria assessment and also blood sampling. All blood sampling was performed during 48 hours of the ICU admission in order to determined the plasma Selenium level by atomic absorption method. 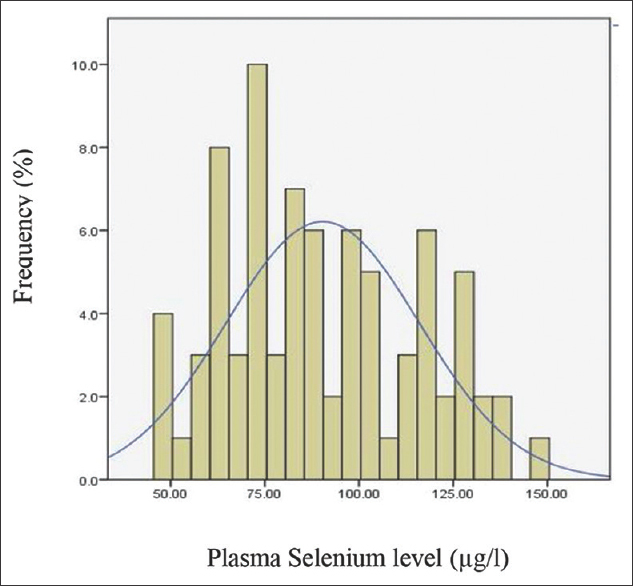 Findings: The mean plasma levels of selenium in male and female was 98.14 ± 23.52 and 78.1 ± 24.46 μ/L, respectively. Although selenium plasma levels was higher in the ICU male patients significantly, both had near normal range (80 μ/L). Conclusion: In this study we found that in early admitted Iranian ICU patients in Tehran, selenium deficiency has not routinely seen but probably will happen during ICU hospitalization. Serum sodium (Na) concentration more than 145 mmol/L is defined as hypernatremia. Hypernatremia carries an acute morbidity and mortality, especially in neonates and infants. Rapid correction of hypernatremia leads to severe cerebral damages, and seizure is the most common neurological complication of hypernatremia. Selection and calculation of an appropriate fluid and its amount is one of the tremendous challenges. It is important to choose the correct amount of suitable fluid and adjust rehydration rate. In this study, we have suggested practical equation to determine the amount of fluid that should be administered to the neonates and infants with hypernatremia. In this equation, the amount of infusate volume will be calculated from changes in serum Na and total body water. However, serum Na and infusate Na will play an important role in equation structure, too. Our suggested equation will help physicians to manage hypernatremic dehydrated patients in a suitable manner with an adjustable rate.